On Super Bowl Sunday, the men’s basketball team, for the first time in school history, went into Duke’s Cameron Indoor Stadium and defeated the Blue Devils 78-74 in an overtime thriller. The win marked the Hurricanes’ fourth consecutive conference victory, putting them at 5-3 in the ACC and 14-7 overall. The Canes are surging and building their tournament resume at the right time, with March right around the corner. The team felt the fan support from the monumental victory as soon as it returned to campus and got off the team bus at 10 p.m. that same Sunday. A group of students rallied around the bus to greet the players, give them high-fives and take pictures. 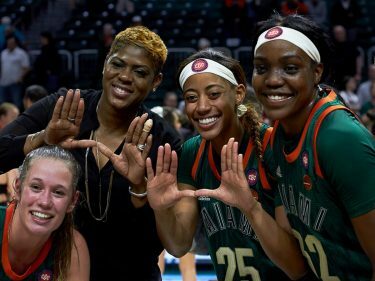 It may have been an unfamiliar feeling for players to receive such royal treatment coming off a bus after a road win, being that Miami is, and always will be, a “football school,” but it’s evident that support for the basketball program is flourishing. Despite the growth, however, there still remains the underlying fact that the increased support has not translated into bodies in the student section. Last Wednesday’s home game against Maryland was the biggest game on the Canes’ schedule to that point. Both teams were .500 in conference play at 3-3 and really needed the victory to catapult them into the conversation for a tournament spot. At most colleges around the nation, tickets are sold out well before tip-off and fans are left begging for tickets outside the arena. Miami won in double overtime, but there were probably no more than 200 students present to witness it. Once you looked passed the lower-level wooden bench portion of the student section, it was empty seats galore. 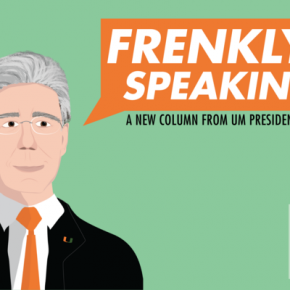 Coach Jim Larranaga got on 560 WQAM’s Joe Rose Show Monday morning to urge and challenge the university community to come out and show support at the next home game Thursday at 9 p.m.
Reggie Johnson, who had his coming-out party Sunday against Duke with 27 points and 12 rebounds, relayed similar sentiments. “I wish it’ll be a packed game,” he said. Johnson says it truly does provide a lift when the home crowd creates a hostile environment for the opposition, and it also makes the game more enjoyable for the team. Larranaga and his players have made several attempts to win student support. The team recently stormed the dorms, so to speak. They visited on-campus housing facilities to give students a chance to meet the players and coaches. The enthusiasm is omnipresent. Now it’s just time to show it at the next game. After all, the cost to go to the game is already paid for in the athletic fee you’re paying in your tuition. Come out Thursday as the Canes face a feisty Virginia Tech squad. It’s a late start at 9 p.m., but there’s still plenty of time for grinding in the Grove afterward.